Human Performance and Productivity (The Blog) – Page 4 – Tips, News, Tools and Techniques. October 1, 2014 May 8, 2014 by C.S. Clarke, Ph.D. I follow Ryan Deiss’s blog at DigitalMarketer.com. He and his team constantly come up with interesting ideas and share a lot of content for free. 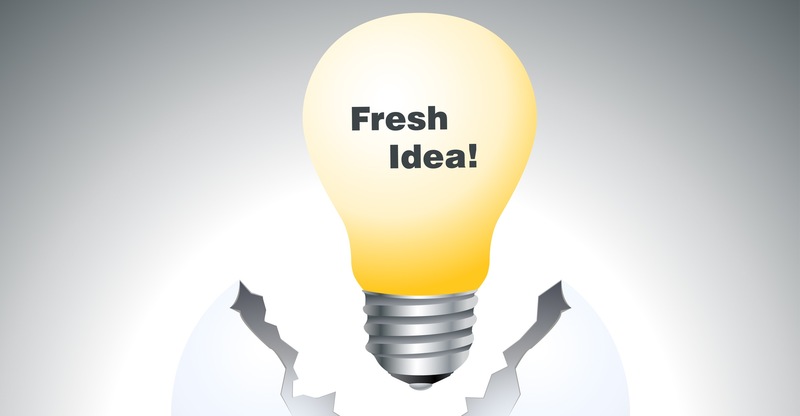 A couple of days ago, Digital Marketer published a list article by Russ Henneberry: “The Ultimate List of Blog Post Ideas.” (http://www.digitalmarketer.com/blog-post-ideas/) It’s a very long article. In fact, he ought to rewrite it enough to meet Amazon’s standards for avoiding duplicate content and publish it as a Kindle booklet. I know I’d pay for something of this quality — if he hadn’t already made it free. It’s 212 blog post ideas. Explained and categorized. Not to mention that he has a downloadable mind map version. If you have a site or blog that you have to fill with content, you can really use this handy tool. Go get it. May 5, 2014 by C.S. Clarke, Ph.D.
What does a cute kitty video have to do with performance improvement? I ran across a sweet, but unusual video from the BBC’s YouTube collection. 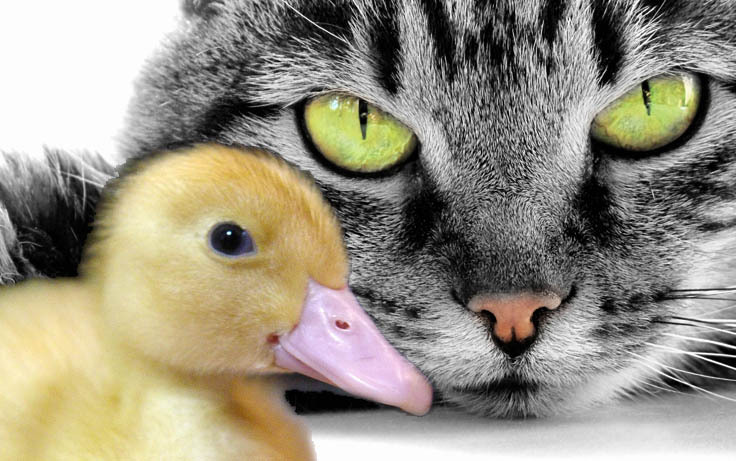 Apparently a cat that had just given birth discovered some ducklings that had just hatched and adopted them as her own. (Rather than having them for lunch.) In their turn, they imprinted on her. The story is a bit longer and has some suspense to it, so even though I’ve spoiled the ending, I’ve included the video itself below. It’s quite charming and not at all like the “cute kitty” amateur offerings you might have been subjected to in the past. The reason I thought it was something for a performance and productivity blog is simple: one of the big takeaways from the story is that if the right circumstances occur, the most exceptional things can happen. Much psychological and business literature is devoted to subjects like “creating change,” “finding the right perspective,” “motivating right action,” and just plain “getting things done.” So stories like this one make me ask what I can do to create circumstances that overcome natural or learned resistances and even instinctual responses. What circumstances are necessary to allow learning and growth? What timing, environment, people, training or other factors will I need to achieve a goal? This video literally shows us that change, growth, progress and even miracles occur when we make sure that we have all our ducks in a row. (Sorry, couldn’t resist.) Enjoy the video. May 1, 2014 by C.S. Clarke, Ph.D.
Are you on an “electronic leash at work?” How does that affect your relationship with your employer? How does that affect your motivation? How does that affect your performance and productivity? There’s a lot written about employee abuse of company-issued cell phones, tablets and laptops. And with good reason. There is considerable dismay growing among employees who have found that they are now expected to be “on call” to their employers 24/7. Many employers are requiring their employees — at least the exempt ones — to answer their cell phones and be ready to work almost any time of day or night. Whether it’s a day off. Or a weekend. Or while on vacation. The employees are required to answer or to return the call if they cannot answer immediately. In order to ensure that they will answer, they are required to carry the phone with them at all times. Moreover, they are required to respond to text messages and emails. Within close time limits. Otherwise, they’d better have a good reason why they didn’t. And, “the dog ate my phone” won’t work. They’re on an electronic leash. Worse, the invasion of work into private life doesn’t stop there. It is quite usual for employers to put GPS trackers on the devices they issue, so they know where you are at all times. To use keystroke loggers. And to inspect cell phones for being used for personal reasons such as having pictures of the employee’s kids. Of course they monitor all calls made on their cell phones. So, they know if the employee makes calls to spouse, friends, kids or the pizza place down the street. Yes, if you haven’t figured it out already, they can fire the employee for failing to answer the phone or respond to emails and text messages. They can fire the employee for making unauthorized phone calls, even in the case of an emergency. They can fire the employee for having pics of the kids on the company cell phone. Or the company-issued tablet or laptop. Yes, there is more: employers can require an employee to use his own cell phones to keep in touch in the same way. They can even require him to let them track his phone. Many employers monitor their employees Facebook and Twitter accounts. Even though the employees don’t connect to those accounts on company devices. If an employee does use company issued devices to connect to accounts on the internet, the employer can retrieve that employee’s passwords and contact lists. The company owns the device and everything on it. Many employees are carrying two phones. One for work. One for personal life. That helps solve some of the privacy issues. Also be sure not to use your company’s internet connection or internal network with your own devices. Do not use any of the company-issued devices for personal business. Keep your own computer and/or tablet for personal use. And do not use your own personal devices for any company business. If the company requires you to use your own devices for company business, get a second set of the cheapest possible devices for the purpose and only use those devices for company business. However, there’s nothing you can do about your employer’s requirement to answer and respond 24/7. The employer make the rules of employment. Employment is “at will.” You can quit if you can’t negotiate better circumstances. Or you can have a written contract of employment that guarantees particular privacy terms. Remember, I said at the beginning that I was talking about exempt employees. Most employers don’t try this stuff with non-exempt employees. That’s because non-exempt employees have to be paid overtime after eight hours of work per day or forty hours per week. So keeping track of overtime hours spent on digital devices could be a nightmare. Not to mention that the skills and knowledge of the non-exempts are not usually regarded as something management wants to tap at a moment’s notice. If you are a non-exempt employee and your employer requires you to be available for work 24/7, keep track of your overtime entitlement. I am not an attorney. Nor do I play one on TV. I’ve told you the precautions that I know about, but there may be more. 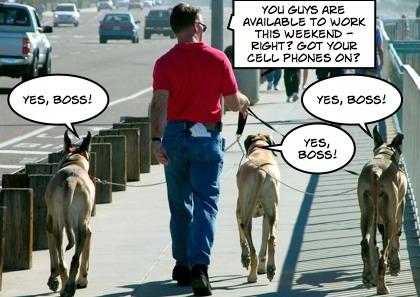 There are good reasons to consult an attorney if you are in a position of having electronic leashes from your employer. First, he/she could tell you more precautions to take against having your privacy invaded or your personal devices searched without a warrant. Second, if your employer does violate your rights, you’ll have a better idea of what they are and an attorney to represent you. In today’s workplaces, you can’t be too careful. Meanwhile, if you are on an electronic leash, I’m sorry to hear it. Be a “good dog” until you can find a better place to work.